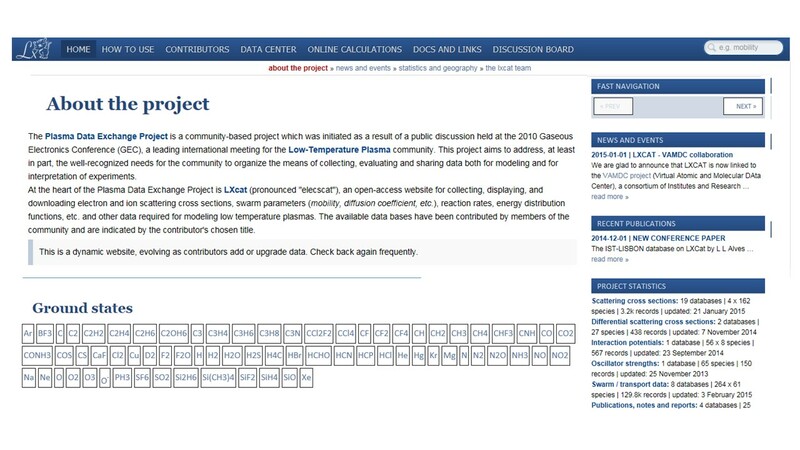 LXCat is a dynamic, open-access, website for collecting, displaying, and manipulating data relevant to modeling low-temperature, non-equilibrium plasmas for science and technology. The data types presently included in LXCat are electron- and ion-neutral scattering cross sections, ion-neutral interaction potentials, differential cross sections, optical oscillator strengths and measured electron and ion swarm parameters (mobility, diffusion coefficients, rate coefficients in uniform electric field conditions). 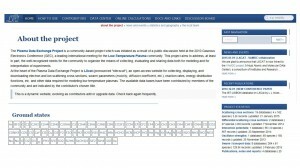 LXCat [www.lxcat.net] is a community-wide effort and at present more than 30 people from the LTPST (Low Temperature Plasma Science and Technology) communities are contributing members of the LXCat team. Data needs in modeling of low temperature plasmas are extensive and include fundamental data for an extremely wide variety of systems, from atoms as might be used in lighting plasmas to extremely complex molecules as are used in plasma materials processing. The full range of data needed for modeling a specific plasma system is rarely available from a single reference. One focus of the LXCat project has been on compilations of “complete” sets of electron-neutral cross sections for different target gas species (mainly ground state). The energy range of interest is from thermal to about 1 keV, and “complete” implies that the main collisional energy and momentum loss processes are well represented. It is convenient to store data for the electrons in the form of cross sections vs. energy and then to use a Boltzmann solver to determine transport parameters as a function of E/N. A simple on-line Boltzmann solver is accessible on the LXCat site and uses the cross from the LXCat databases as input. The calculated transport coefficients can plotted along with experimental results (also available in some of the LXCat databases). Anyone willing to contribute relevant data is welcome to set up an individual database using the existing LXCat structure and on-line tools. Maintenance of the database and inclusion of relevant references are the responsibilities of the individual contributors. In some cases, the contributors are the people who have measured or calculated the data. In other cases, the contributors have compiled collections of data from the literature for use in their own modeling activities and are willing to share their data files and references. Evaluation of the cross section data sets available on LXCat is a key issue that motivates users as well as contributors. LXCat is continually evolving by adding new data types, new contributors, and additional data. LXCat includes a “time machine” tool so that data as they existed at any given date in the past (since Nov 2013) can be retrieved from the site. This gives the contributors the flexibility of updating their datasets while maintaining traceability.